I’m starting to feel the pressure to get things done around here. I spent most of Saturday baking and a good portion of today was dedicated to washing baby clothes. Tuesday puts us at 35 weeks, which for me means it could be any time. Our oldest was born at 41+ weeks, but the other 3 have been much earlier – #2 was 35 weeks, 3 days; #3 was 34 weeks, 6 days and #4 was 36 weeks, 2 days. So you see where I might be getting a little anxious. 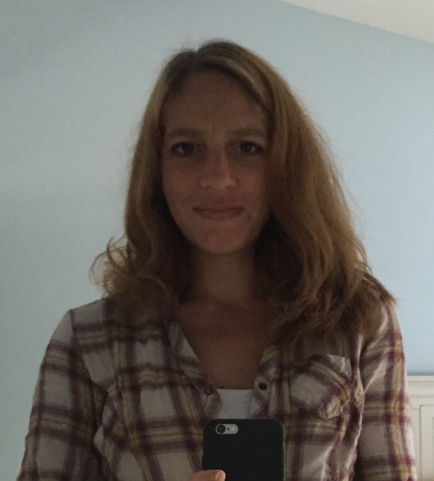 However, I’m feeling pretty on top of my bulk cooking list I wrote up a few weeks ago. There have been several deviations from that list and a few snags along the way. 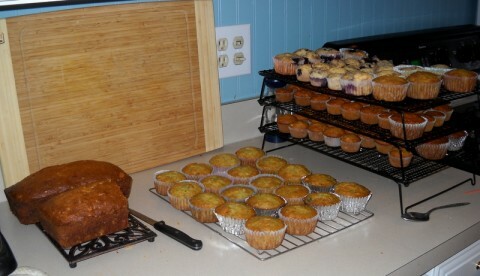 (Snag #1 would be when I spent a whole day baking only to have us eat almost everything I made that day within a week. Oops!) But overall I am enjoying the sense of accomplishment I get as I watch my brand new 7 cubic foot chest freezer fill up. Oh, the joy! While I usually do some freezer cooking every single month, spaced out over the first few days after our monthly grocery trip, this bulk cooking project feels so different for me. I am really breaking things up and only working as I feel inspired. If I just don’t feel like doing anything extra one day, I skip it without guilt. I can’t believe how freeing this has been and how much I’ve gotten done in spite of that attitude. Most days I just do one or two extra things for the freezer. Since I first wrote that li st, I’ve only spent 3 days where a good chunk of my day was devoted to working on things for the freezer. This Saturday was one of those days. I decided I want to get us really stocked up on muffins. We all love muffins and they are great to have on hand for breakfast, snacks or even to go with a light lunch. It was a chilly, rainy day and I love spending the day in the kitchen on days like that. So while my husband and kids cleaned the house and washed and folded 5 loads of laundry (lucky, aren’t I? 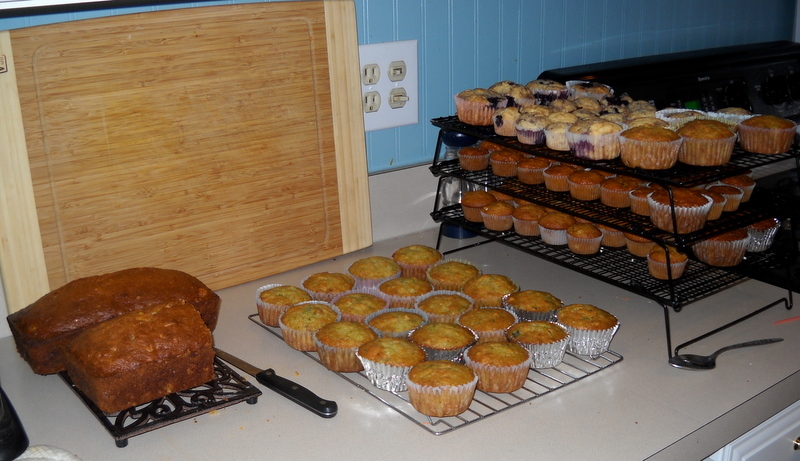 ), I baked up a storm. And best of all, I got to end the day by going on our last before-the-baby-is-born date night. That’s what I’d call an all around perfect day. 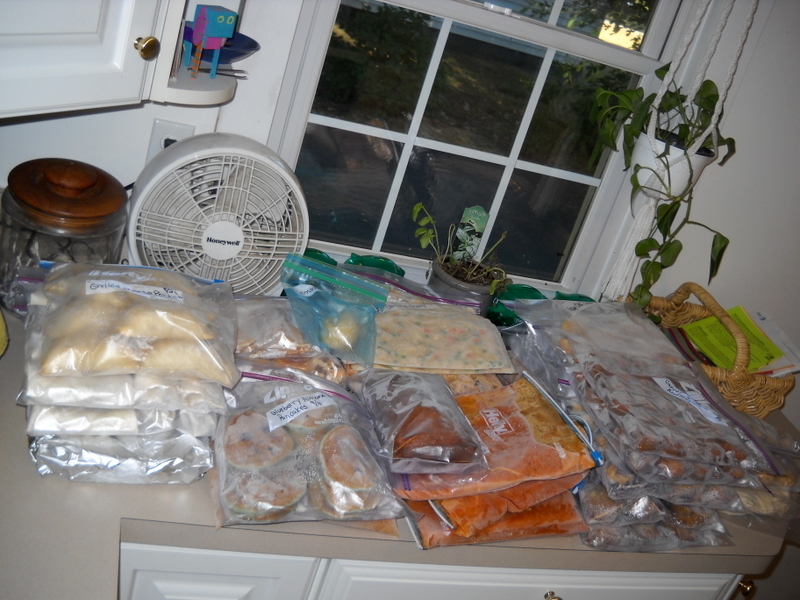 So after that full day, here is what my current freezer stash looks like. My husband also asked if I had a freezer map so that he, and whoever watches the kids while I’m having the baby, can find everything. I don’t, but I think it’s a great idea! So that is also on my to-do list for this week. The other day I realized that there are a few freezer cooking questions I haven’t had time to answer yet, so I’m working on a post to answer all of those. If you have any freezer cooking questions, or if you have any great freezer cooking tips to share, please leave a comment or send me an email. Thanks! I too am very impressed! You’re making me feel pretty lazy right about now! You’re amazing. I never could have convinced myself to do even a fraction of that amount of freezer cooking before my own babies came. How lovely it will be for you to not worry about cooking after the baby is born!! Amazing AND wise. I am in the process of starting freezer cooking. We are moving next and im going to purchase a chest freezer. When you freeze cookies do u freeze the dough or the actual cookies after you have baked them? best wishes in your last few weeks! I am so impressed with your freezer cooking–one day when I’m pregnant I hope to do half as much as you’ve done here, how awesome! Wow!! That is alot of stuff! 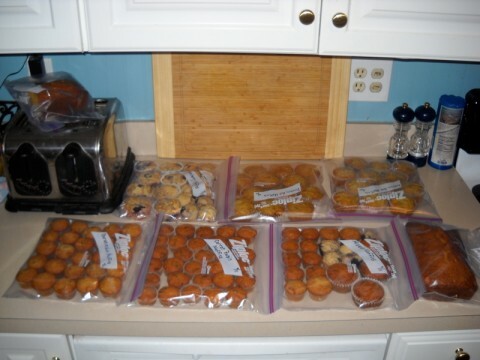 Before I have a baby I usually have about 10 meals in the freezer but not so much baking. Part of the reason is that I have relatives that bring lots of baking over. I just tried your ham and cheese pockets. So easy to make lunches with those. Make sure you take time to put your feet up too! I must say, I was already impressed from reading your plans, to the point where I was actually trying a little freezer cooking myself. Specifically, I cooked up 2 dozen bacon cheddar biscuits to put in the freezer. Went outside to talk to the handyman, and came back in to find only two biscuits still on the plate, a dog on the couch with half a biscuit in his mouth, and crumbs everywhere. 😛 I was so disheartened I stopped trying freezer cooking before I even really got started. Especially after the dog was sick all night (though I admit to feeling a tad vindicated). Way to go! I was able to do this before our two kids and with the second, I was able to stock nearly 60 dinner meals and lots of breakfast foods, too. What a difference it makes! For the first 3 months, we were set and it eased an otherwise burden for me! How long do these recipes keep well in the freezer for and if you could include cooking tips for after it’s thawed out on the meals, that would be great! 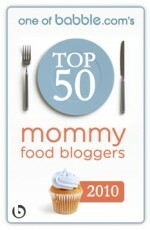 You have alot of great recipes!